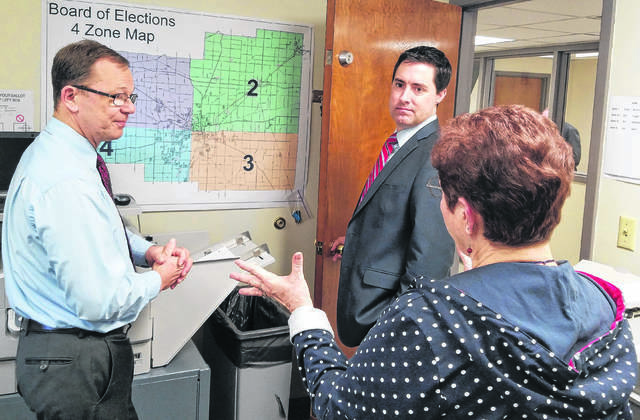 Frank LaRose, middle, Ohio’s next secretary of state, visited with Allen County Allen County Board of Elections Director Kathy Meyer, right, and Deputy Director Mark Vernik during a visit in April. LaRose said he wouldn’t second-guess Jon Husted’s process of purging names from the elections list but hopes to make future large-scale purges unnecessary once he’s in office. COLUMBUS — Secretary of State-elect Frank LaRose says he won’t second-guess Jon Husted’s decision to purge what could be tens of thousands of names from Ohio voter rolls. But when the GOP state senator takes over for Husted next year, he hopes to get legislative changes that make such extensive purges unnecessary. “I think we can come up with something better … that makes it easier for people to get registered and stay registered to vote, keep their address information updated and work to encourage people to stay active in the elections process so that we don’t have people that sit out six elections,” LaRose said. LaRose said he received only a short advance notice that Husted was initiating the purge, a legal process upheld 5-4 by the U.S. Supreme Court in June. It affects Ohioans who haven’t cast a ballot since at least 2011 and 2012 and did not respond to ensuing notices from their county elections board about their status. Husted send a directive Tuesday to elections boards saying cancellation notices must go out no later than Dec. 12. If a voter replies, they stay on the rolls. If they do not, their names must be purged by Jan. 11. Critics said a qualified voter should not be removed from the rolls merely because they decided not to vote for several years in a row, and that it disproportionately affects the poor and minorities. LaRose wants to change Ohio law so whenever a resident comes in contact with state government — such as renewing a license or paying taxes or signing up for benefits — the state pro-actively reaches out to make sure their voter registration is updated. He said he didn’t feel it was his role to weigh in on Husted’s decision and wouldn’t answer when asked if he agreed with it. “The policy decision he makes in the remaining month and a half in office are his decisions to make. He’s secretary of state until Jan. 13,” LaRose said. https://www.limaohio.com/wp-content/uploads/sites/54/2018/11/web1_LaRose-Frank.jpgFrank LaRose, middle, Ohio’s next secretary of state, visited with Allen County Allen County Board of Elections Director Kathy Meyer, right, and Deputy Director Mark Vernik during a visit in April. LaRose said he wouldn’t second-guess Jon Husted’s process of purging names from the elections list but hopes to make future large-scale purges unnecessary once he’s in office.